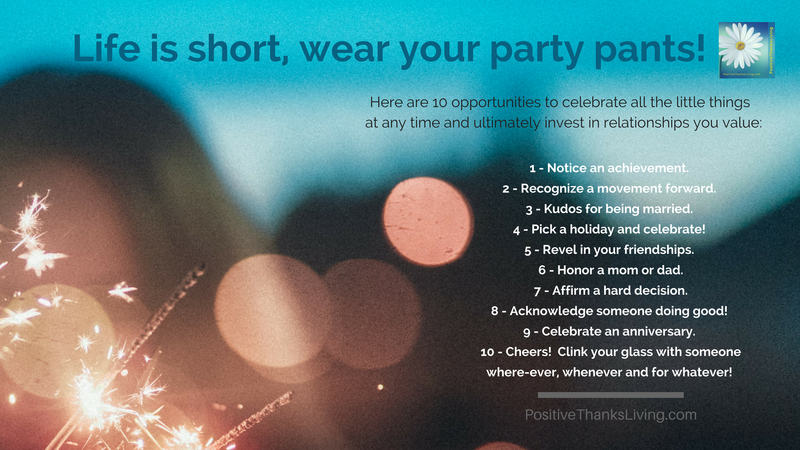 Celebrate all the little things – 10 opportunities to invest in relationships! Celebrate all the little things. No need for a special day for a party. Any day can be the right day to celebrate and invest in relationships. 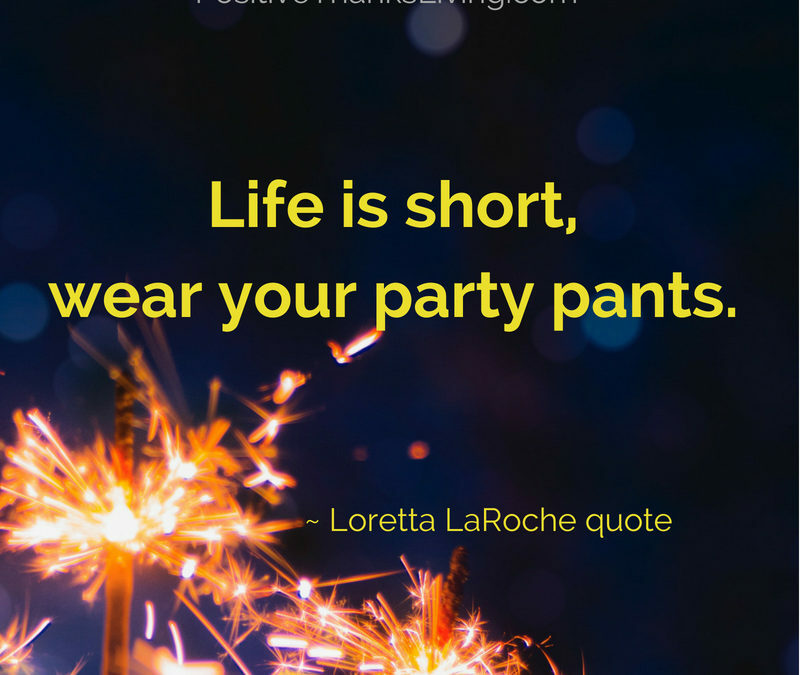 “Life is short, wear your party pants. Life can be rough. Even the day-to-day grind can pile up to become a seemingly overwhelming weight. Heap on a few helpings of seeing friends also struggling, and it may become difficult to look at the bright side. 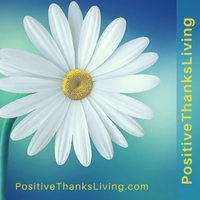 What’s the antidote to this burden if we want to be positive? Throw little parties – impromptu celebrations for those who add value to your life. 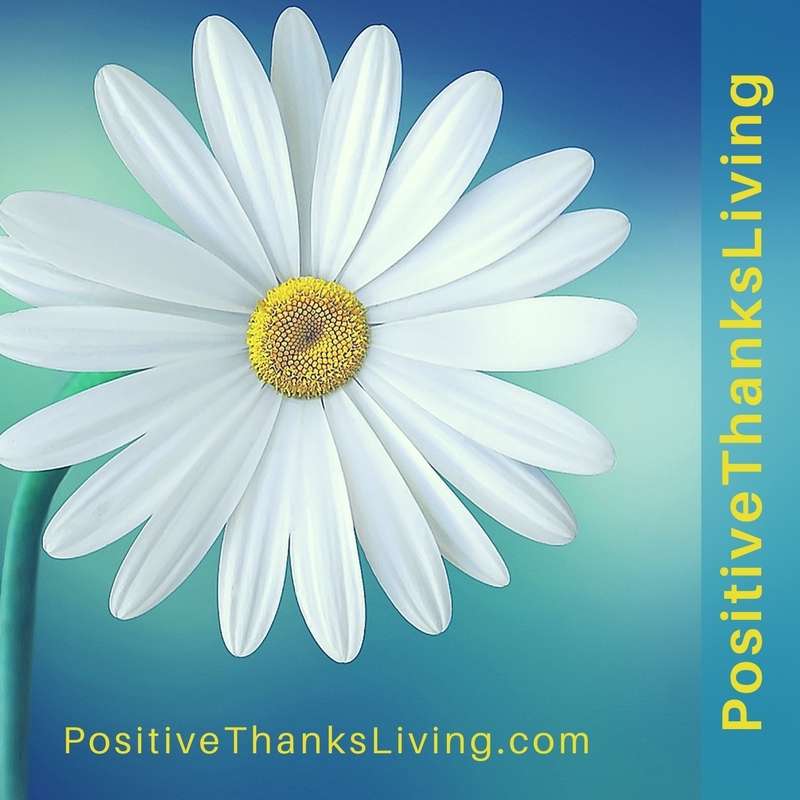 I’m not suggesting being excessive, expensive, or extravagant… rather, focus on finding the little opportunities to celebrate something small, yet important. Uplift. Encourage. Notice and affirm. 1 – Notice an achievement. Has someone graduated, bought a new vehicle, home, hat, dog or shoes? It might seem silly, but any achievement, large or small, is an opportunity to celebrate. Send a card. (Yes, a real, snail-mail card!) Show up with a cupcake. Or if you’re pressed for time, then a simple “high-five” is always a good way to celebrate all the little achievements. 2 – Recognize a movement forward. Sometimes it takes a long, long time to reach a goal. Think about all those really tough, long-term missions: growing a business, losing weight, recovering from an injury, overcoming an addiction, finding peace after an emotional upheaval, etc. Invest in your relationship with that person by acknowledging a movement forward (however small). A small, private encouragement, praying with that person to give thanks, and even a literal pat on the back are some ways to recognize a movement forward. 3 – Kudos for being married. Growing a healthy marriage takes an investment. Are there couples around you who are doing well in their relationship? Celebrate with them! (It doesn’t need to be their anniversary.) Buy them a book on building a good marriage – this one is a must for every couple. This is one I’m reading right now – it’s about making your marriage matter now and for generations to come. (And here’s a marriage book I wrote.) Write a little note into the book telling this couple how much their marriage is an inspiration! Just consider: people regularly read and study for their profession. It’s a given. Yet they expect a marriage to be easy without any investment? Huh? Rob and I write about husbands and wives leading meaningful lives, so that makes us focus on our own relationship also. 4 – Pick a holiday and celebrate! I’m not talking about the obvious holidays. Check out the current date at this website, and see what “national day of…” it is today! 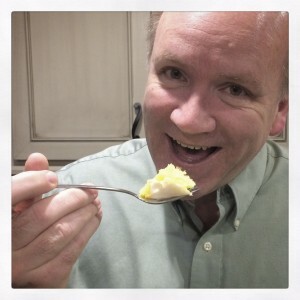 On March 29th I discovered it was National Lemon Cake Day, so I made Rob some lemon cake to celebrate, and took some along to church. It was silly, yet fun. (Read about it here.) Pick anyone – and celebrate that day with them! 5 – Revel in your friendships. Having a friend is precious. Old friendships or new friendships are all something to celebrate. Get together for coffee today with a friend and tell them how much you value them. Rob and I are visiting the cities where we grew up, and one of the joys is connecting with friends. We may not see each other for a year or more, but we still value our connection. Who haven’t you invested time with lately? Reach out – now! 6 – Honor a mom or dad. It matters little whether children are small or teens, parenting is hard. Give a parent a “high-five, you’re-doing-well” accolade. Take them out for ice-cream, give them a funny DVD, and just smile kindly at them while they’re doing the hard stuff of parenting. Tell them they’re doing a good job. Your love and affirmation can make a difference when the going is really tough. Celebrate their job as a parent! 7 – Affirm a hard decision. Life is full of ’em – those hard, sometimes bitter-sweet decisions. Sometimes they’re so fraught with negativity that it would be easier for you to say nothing. And yet… sometimes years of hardship have led to this point, and more anguish than we can imagine has gone ahead of the final decision. Don’t judge or criticize. Help them acknowledge this hurdle. It’s hard. I get it. Maybe just sitting with that person, putting an arm around them, and saying nothing is enough of a celebration. 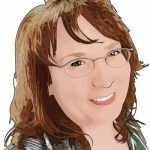 8 – Acknowledge someone doing good! 9 – Celebrate an anniversary. When did you first meet someone? Measure the days you and a friend have been in school or calculate how many minutes you’ve been married. (As I write this sentence Rob and I have been married 17,815,543 minutes!) How long have you been living in the same place or attending a church or drinking the same soda/pop? If you use the Elapsed Time Calculator anything can be celebrated as an anniversary! Clink your glass with someone where-ever, whenever and for whatever! Every time you have a drink – even water – clink your glass with someone else. This moment you’re in – right now – is worth celebrating. It will never come again! Cheers! Yes. 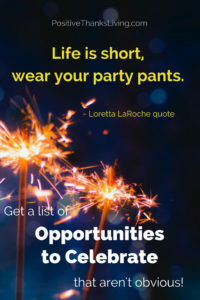 Life is short – be ready to party at any moment! Which opportunity will you grab today? Leave a comment! Here’s a pdf of the list if you want to download and print it – or an image to load as your computer’s wall-paper if you want to be reminded. Love, love, love this super positive post! I could not agree more. I look for ways to help others, or to encourage someone. Support some one. It actually helps me deal with my own personal struggles. It makes me happy!! !